Every day articles are published in newspapers, television, magazines, radio, Internet, etc.exposing the horrors of evidence based conventional medicine. USA has the most expensive medicine in the world, yet it is ranked 37 in quality by the World Health Organization (out all the developed countries). Conventional medicine is the number one cause of death in US. Hundreds of thousands of deaths a year. Enormous amount of environmental pollution. The creation of superbugs caused by excessive use of antibiotics. The impact of conventional medicine leaves us miserable. Problems are not solved. We are addicted to the idea there is a pill for every discomfort. This is exploited by Big Pharma and their TV commercials. However, these commercials for prescription medications, warn us of the side effects—including death. People continue to drink the Kool-Aid and line up for destructive medications and procedures, like they’re candy. People rationalize why they need to comply. Why is this happening? More people die each year from conventional medicine than from the Vietnam War—and we had a major uprising against the war. Yet, we accept poor healthcare with the hope of being happy.We fear we will lose our happiness to some “condition.” Fear based medicine works. It makes people believe there is a rainbow after every magical pill, but the reality is we become miserable. Our book exposes why “evidence based medicine” is all smoke and mirrors. To be human means to have body, mind and spirit—a 3-legged stool. Evidence based medicine reduces us to just one leg—the body. This unstable stool is further reduced to smaller and smaller parts. Scientific research confirms the whole is greater than its parts. Living life in a reasonable and responsible way moment to moment results in genuine happiness. We need to take the responsibility to change our lifestyle and live life in a congruent manner with nature. 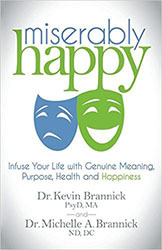 Miserably Happy, the book, may be purchased at the Brannick Clinic or by calling our LaGrange Park office at (708) 447-2468. It may also be purchased on Amazon.com.